Delivery charges and payment method cash on del. I think the screenshot explains what I mean without saying much. Standard delivery is set at £4.95 and then cash on delivery as a payment method. This give conflicting information on the checkout page. What I think would make this easier to understand would be the option name change to "pay on collection" which would then remove the standard shipping cost? Last edit: 8 years 4 months ago by Jaddi01. 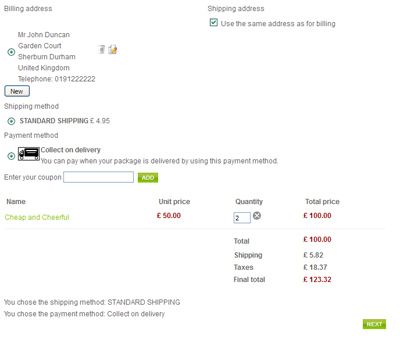 Yes, the shipping price is displayed in two different ways between the shipping view and the cart view. We will improve that for next version. In the mean, time, you can edit the file shipping of the view checkout in the menu Display->Views and change the "shipping_price" to "shipping_price_with_tax" to get the price with taxes on the shipping view as well.